We want to reproduce the transcritical test case of Audusse et al, 2011, section 5.6.2. We need a field to store the variable bottom friction. The viscosity is set to ν=0.01m2/s and the bottom friction is variable. We vary the number of layers. We impose the outlet water level. We initialise the topography, the initial water depth h and we create a field hc to check convergence on h.
We call the friction event (below) to initialize the bottom friction. We impose a constant inflow of 1 m^2/s at the inlet and a Neumann condition at the outlet. We use the Strickler relation: k(h,U)=gS2h1/3∣U∣ with S=25m1/3/s the Strickler coefficient, h the water depth and U the depth-averaged velocity. Note that we have to use a lower Strickler coefficient (i.e. larger friction) to get results comparable to those of Audusse et al, 2011. Uncomment this part if you want on-the-fly animation. "set xl 'x'\nset yl 'h'\n"
At the end of the simulation we save the profiles. Free surface and topography. This can be compared to figure 9 of Audusse et al, 2011. 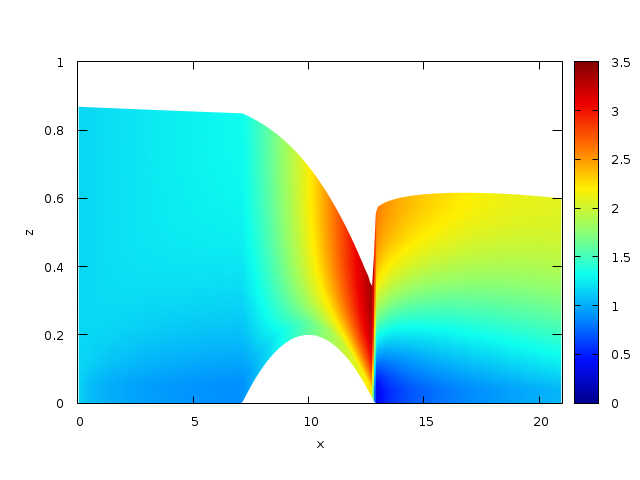 Horizontal velocity field (15 layers).